Brent Spiner’s had myriad other roles on the big and small screens, as well as in the legitimate theater, but he’s probably best known for playing Lieutenant Commander Data on Star Trek: The Next Generation. Although the character was an android, Data’s aspirations of becoming “one of us” allowed Spiner to run the gamut of human emotions, and hone his dramatic and comedic chops. Spiner’s current projects touch on both ends of that spectrum—he stars in Robert Kirkman’s Outcast adaptation, as well as Roland Emmerich’s bombastic sequel, Independence Day: Resurgence. As Sidney, Spiner lends a dark and dapper presence to Outcast, while his miraculously revived Dr. Brackish Okun in Resurgence provides some far-out comic relief. The A.V. 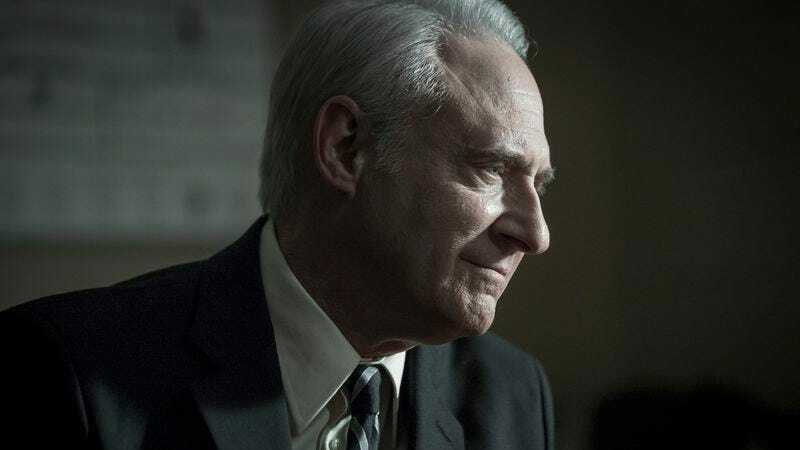 Club spoke with the actor ahead of the premieres of Outcast (whose first season is already underway) and Resurgence (which opens June 24) to “meet” Sidney and catch up with Dr. Okun. The A.V. Club: Rome, the fictional town in Outcast, is full of uncommon folks—your character, Sidney, is just the latest arrival. We haven’t gleaned much about him from his appearance so far, but is there anything you can tell us? How does Sidney compare to other characters you’ve played? Brent Spiner: It’s really complicated, and it’s hard to describe. [Sidney] is the most difficult character to describe on the show. But kind of like Data on Star Trek, I’m finding this character similar in the sense that we’re sort of discovering him and building him as we go along. It’s kind of like I’m figuring out the character at the same time the audience is. AVC: What was your exposure to Robert Kirkman’s work? Were you a Walking Dead fan before taking on this role? BS: Not really. Honestly, I had met Robert one time—we were at Comic Con, and he was sitting at a table doing his comic books, and he saw me walk by and shouted my name. I came over and spoke to him for a while, and I’m really glad I did. Robert is a fantastic guy, but I didn’t have much association with him before this. I knew he had done Walking Dead. I subsequently have watched Walking Dead, but I hadn’t watched it before. He is, personally, the opposite of what you get on the screen and in his comic books. He is a very funny, very engaging, very accessible human being. AVC: There’s definitely a lot of humor in the comics and in The Walking Dead TV show. Did that help you decide to do the show, or were you already sold on the horror angle? BS: I’m not a genre guy at all. I’m not a huge fan of horror, or fantasy, or space, or sci-fi, or any of that. I do see it all and experience a lot of it because I have a 13-year-old son. So, we find ourselves watching a lot of Marvel things and stuff like that, but my taste is—I’m more interested in the past than I am in the future, and I’m more interested in things that actually happened than things that people are making up. That’s just where I spend my leisure time, but I’m happy to be working on something, you know, in this genre. It’s been fun and exciting, and I’m totally open to it. AVC: You’ve appeared in several anthology and horror series in the past, including The Twilight Zone, but now you’re inhabiting a regular role on Outcast despite not being a “genre guy.” What has that experience been like? BS: It’s really just like working on anything else. You know, when they say “action,” reality sort of changes, and you’re in that world. But up to that point, it’s like working anywhere. You just hope it’s a collaborative situation and that you and the people you’re working with get along. That’s the way it was. Work is work. I found through the years that people, for the most part, work the same way. I did a movie years ago… I had one really choice scene in The Aviator for Martin Scorsese, and I was really, really nervous about that because he’s a giant. The delight that I found out was that he works just like everybody else. You’re just trying to find the truth of the scene and play it as best you can. That’s sort of what everybody goes for. Outcast is no different than anything else, except that I have to live out of town. AVC: The devil seems to be having a moment in pop culture. We’ve got Outcast, and there’s an Exorcist reboot coming up—Fox even has a “cop procedural” take on him with Lucifer. What do you think is behind the renewed interest? BS: Well, there are iconic figures throughout literature that are used over and over again, and Lucifer, the devil, happens to be one of those. But then so does Sherlock Holmes, you know? I don’t think it has any real meaning other than they’re interesting to work with, because they’re such giant archetypes that everybody knows about and relates to. I think that’s always going to be the case—that these iconic, huge archetypes are going to come in and out of popular culture as time goes on again, and again, and again. I think it’s just coincidence sometimes that there’s more than one project at the same time that employs those characters. I don’t think it’s necessarily related to the fact that the world is falling apart. I think that’s completely a separate story. AVC: In a recent interview with Entertainment Weekly, Robert Kirkman said that Outcast was going to be scarier than The Walking Dead. Are spooky children just inherently scarier than zombies? BS: Well, I don’t know, really. Is possession more frightening than zombies? I think it may be, because, again, that stuff’s somehow tied to religion and things that actually kind of exist in people’s real fears, as opposed to zombies, which are complete fantasy, as least as far as I know. I’ve never bumped into one. AVC: While we’re on the subject of the walking dead—Dr. Brackish Okun is alive and back for Independence Day: Resurgence, despite all evidence to the contrary in the previous film. BS: What do you mean? There was no evidence. AVC: You’re right. We didn’t really see the body on a slab somewhere, right? BS: That’s right. You know, we didn’t have a doctor telling us, “This person has perished.” [Laughs.] You know? We just cut away in the last film, and we never knew what happened to him. But it was presumed, as I’m sure you’re getting at, by a lot of people that he was indeed dead. I’m happily—and I’m sure I’m happier than almost anybody about this—he is indeed alive. AVC: When we last spoke to you, you mentioned that you had a bead on that character immediately. You read the part, and you knew how you’d play him. What were your instincts when you read the Independence Day script? BS: I think what I was getting at back then, and it’s still very true, is—I don’t know about other actors or people who create on different levels, but inspiration doesn’t hit me all that often. Usually, it’s just, I’m slugging my way through something trying to find the truth of it, and trying to illuminate the author’s intent. I mean, that’s our job. But every now and then, inspiration hits, and I find myself doing just the opposite of what is on the page, and finding that pays off. In the case of Dr. Okun, I read the script and I felt he’s just a guy. He’s just a doctor who had a few lines about doing this alien operation, and that was about it. That, and he’d been in Area 51 for a long time. It suddenly hit me, and I don’t know why, that he could be an old hippie, you know, who had gone to Berkeley and taken maybe one too many tabs of acid. Next thing you know, he’s in Area 51 for the rest of his life and still stuck in the ’60s. So, when I auditioned, I did the scene like that. My first audition was for [producer] Dean Devlin, and he kind of really liked what I was doing and said, “I want to show this to Roland.” The next day, I got a call from them. They said, “You’re the guy.” I went in and met Roland, and I said, “Can I have long hair?” He got on the phone instantly and ordered long hair for me. AVC: Well, now we know what Dr. Okun was up to before he got to Area 51. So what has he been doing since the war of 1996? BS: Well, he’s been sleeping and dreaming a lot, I think, because he’s been in a coma since then. I don’t think it’s a spoiler. You can make that determination, but I think it’s been revealed somewhere that he was in a coma. AVC: Unlike most of the information surrounding Area 51, that’s one tidbit that did get out. BS: Yeah, I didn’t actually want to tell anyone, but I think Roland told me they had already revealed that. [Okun] really has not been conscious for 20 years, and now [the aliens] are back, and he wakes up. He has a little more knowledge of them than most people and a little more connection than most, with the exception of Bill Pullman’s character, President Whitmore, who also was inhabited by them in the first movie. It’s interesting—in the first film, he was a throwback to another time already. This took place in the 1990s. He was a hippie from the ’60s. Now 20 years have gone by, and he’s still stuck back where he was. He’s still the same guy. Twenty years have happened that he doesn’t even know about. AVC: With all the time that has passed, what do you think would freak him out the most about the year 2016? That is, aside from the second invasion? BS: I guess Trump for president, right? That would freak anybody out, wouldn’t it? Or should. AVC: There was a time when that was just a gag on The Simpsons, right? AVC: We’ve come full circle—we’re back to talking about the world going to hell. But it’s very topical, like the plots of Resurgence and the original, which have this element of xenophobia in defending the country from invaders. You’re hitting on all the hot-button issues. So what’s going to be the next one you tackle, in film or on TV? BS: I don’t know. I’m hoping it’s somewhere in the neighborhood of trying to make people laugh. AVC: You’re ready to switch things up to do more comedy? BS: Well, comedy really is my bread and butter, even when I’m doing a serious character, with the exception of Outcast. I have found very little humor in this character. Most of the time, what I do, somewhere there is comedy in it. Certainly, in Independence Day, Dr. Okun is a comic character. AVC: Does that mean you’re planning to do more work on your webseries Fresh Hell? BS: You know what? I would love to, but I don’t think it’s going to happen. I just had a thought about it last night. I thought about what if we pick up [my character] where we left him off five, six, 10 years later, whatever. I wish I could have kept going on that. It was a real joy shooting that and working on it, but the problem was I just couldn’t keep paying for it. That’s what was happening. We did two seasons, and I paid for them. There was no advertising or anything like that. They didn’t cost a lot of money, but it wound up costing more than I could keep paying. We had a crew that was working for free, and we had creators—the director and the writer and I—had all decided that if we were going to go forward, we needed to start paying people. We just didn’t have any money to do that. I loved doing it. I really did. We had plans for a third season. We had ideas. I could have done it for another 10 years. I wish it had spun into a television series, and I’d be happily doing that for years. AVC: So let’s say it’s 20 years from now, and there’s somehow yet another alien invasion. What’s Dr. Okun doing? BS: Well, you’ll find out at the end of the movie. I think he’s still around, and I think he’s still a hippie. I think he’s just an old hippie in 20 years. [Laughs.] You know what, frankly, if the movie is a success, which I’m very hopeful for, I don’t think it will be 20 years before there’s another one. AVC: And you’d be on board for it? BS: Oh, I’d be on board for another five if they want to do it.